On Monday 8 August 2016 members of Thurrock Marching Brass attended a High Voltage Big Band rehearsal where Trumpet supremo Louis Dowdeswell gave a masterclass in the art of trumpet playing. The young members were inspired by this amazing British talent, as was everyone present. 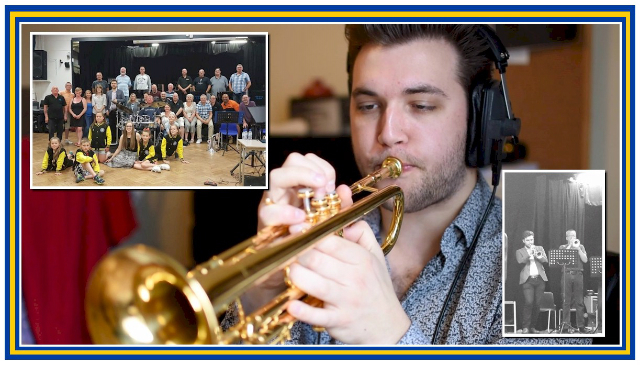 Louis is just 22 years of age and has already started to make his mark on the music scene in so many areas, including playing alongside the incredible Wayne Bergeron, global Trumpet playing superstar. This is the sort of experience that the young members of Thurrock Marching Brass will remember for a very long time, and who knows, one of them could be the next Louis Dowdeswell or Wayne Bergeron. Thurrock Marching Brass would like to thank High Voltage Big Band’s Director, Steve Lees for inviting the young members along for this experience. It was a special thrill to see Corps Director, Jay Lindner, standing next to Louis when he joined in the rehearsal with High Voltage, using the TMB Chairman Paul Morgan’s G Bugle, which was a first for Louis too. Speaking of the evening, Corps Director, Jay Lindner comments “I am so pleased for our youngsters to have met and interacted with one of this country’s most amazing talents in Louis Dowdeswell. I could barely believe that I was myself standing alongside him as he joined in the High Voltage Big Band rehearsals, and what a lovely character he is. A genuinely nice guy who was excited to share fantastic tips for our youngsters and everyone present. If you have never heard Louis play, then google him or check out his Youtube videos. This man is destined to be one of the great trumpet players of our generation and on behalf of all our youngsters, I would like to thank all of my High Voltage Big Band friends, and Louis himself for such a brilliant experience for the kids”. Posted by News Editor on Tuesday, August 9th, 2016. Filed under British Youth Band Association, FrontPage Feature.